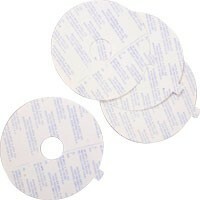 This is used to adhere traditional pouch/mounting ring appliances to body. It is 3-7/8" outside in diameter (9.9cm). Pre-cut stoma openings up to 1-5/8" (4.2cm). My original supplier quit carrying this product so I had to find another. I found Vitality carries it at a good price and delivered it in a timely manner.